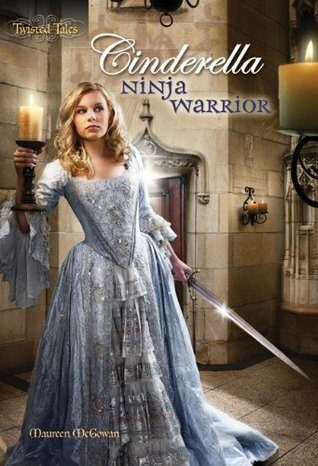 Today's choice issssss... Cinderella: Ninja Warrior (Twisted Tales #1) by Maureen McGowan!!! Goodreads Summary: "In this fast-paced story full of adventure and romance, Cinderella is more than just a servant girl waiting for her prince—she's a tough, fearless girl who is capable of taking charge of a dangerous situation. Seeking to escape the clutches of her evil stepmother, Cinderella perfects her ninja skills and magic talents in secret, waiting for the day when she can break free and live happily ever after. In a special twist, readers have the opportunity to make key decisions for Cinderella and decide where she goes next—but no matter the choice; the result is a story unlike any fairy tale you've ever read!" Okay, so I don't know if any of you have seen this novel, as well as the next in the series (Sleeping Beauty: Vampire Hunter), but it's a fairy tale, "Choose Your Own Adventure" kind of book. It's actually very entertaining with all the twists and turns. I love that you can choose all different paths for this story to follow. It lets you read and reread every possibility without getting bored with the story. It makes you wonder if Cinderella ever needed to be saved, especially in this take on things. Now, getting in to the technicalities. Well, this novel does have fun characters, though not fully developed. There were questions I had with multiple of them, and they truly didn't have too much depth. It ended too abruptly. Also, there were questions left unanswered by the author as well in regards to the plot and action. I do like a strong female character, and I think that younger readers may enjoy this as well, as it truly isn't inappropriate. Conclusion: So, while it's fun to read, and the new take was seriously a great one, this book is a very light read. It is more of a beach read, or something to keep you busy for a cruddy day. I do recommend this though, because you'll love how the author mixes in the warrior aspect to make a chick that can save herself, thank you very much. You could even use this as a bedtime book for a kiddo (yours, ones you babysit/nanny, etc.) to show that girls who are strong and determined can make magic all by themselves, no prince needed to coddle them. Overall though, this is a good read for when you can't focus for too long and want to read something interesting.